A sound concert can be conducted for a group of any size in the comfort and convenience of home or workplace. During a sound performance, the exquisite tones create an atmosphere of peace and tranquility, transporting one to an inner retreat of rest and deep relaxation. Participants are encouraged to make themselves comfortable with a blanket, yoga mat or cushion whether sitting in a chair or on the floor. This signature event awaits you - a singing bowls concert is a gentle yet powerful way to integrate relaxation into one's fast paced life. 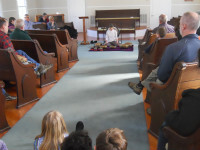 The singing bowls also offer, to those who are facing life challenging circumstances, a relaxation technique to reduce stress and enhance a greater sense of peace. The bowls are a gentle, yet powerful way to integrate relaxation into one's therapy as a complement to western medicine, with the intention of supporting health, recovery and quality of life. In addition to the Concerts, Bright offers several workshops that are hands-on participation for a group. *Expression thru the Vibrations of Sound & Color, *Toning, Sound & Smiles, *How to Play Bowls and Make Joyful Sounds. All workshops are designed to spark imagination, insight, creativity and fun. For more information and a schedule of events click here. private events, retreats, clubs, support groups, yoga studios and spiritual centers, reunions, vacation gatherings of family and friends, bridal weekends, memorial services, youth programs, retirement centers, workplace wellness programs, university presentations, civic, business and staff gatherings. Bright is also available for private individual sound sessions. Rates are subject to the size of group and travel distance.